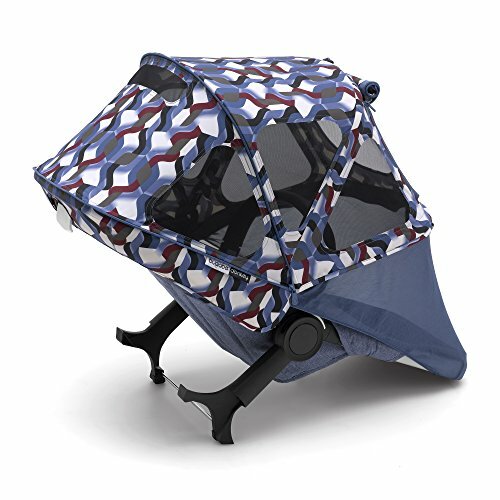 The multi-functional Bugaboo Donkey Sun Canopy, available for all strollers, provides sun protection and extra ventilation on hot sunny days. Highly durable fabric is water & oil- repellent and provides UPF 50+ (excl. integrated mesh panels) while fine mesh lets cool breeze through. A zip-up window allows extra ventilation and easy access to your child. Position the canopy to ensure your child is protected throughout the day. Compatible with all Bugaboo Donkey models, dedicated version for all strollers. UPF 50 plus and water repellent (excluding integrated mesh parts). The fine mesh allows cool breeze through. Multifunctional sun canopy: offers head-to-toe sun coverage.